The château originally belonged to the Marquis de Rochegude, who used it as his summer residence. The surrounding region sat astride the frontier of France and the papacy from 1274 to 1797. The village and château were governed by two sovereigns and two priors—one representing the French king, the other the pope. This arrangement worked well until the Huguenots entered the area in the 16th century. Barons des Adrets, a Huguenot captain, attacked the fortified castle and did some damage, but he was driven back. The château was eventually restored, and some new terraces were added in the 18th and 19th centuries. The Château de Rochegude is a member of the Relais & Châteaux association, which maintains high standards of accommodation and fine dining in a traditional atmosphere. The hotel sits on 10 hectares (25 acres) of parkland. Take a stroll early in the morning, and you’re likely to see deer. Open: all year. Hotel closed Sunday evening and Monday from November through the end of March. Rochegude is a short distance east of the Rhône River and 12 km. north of Orange. The château is at the junction of D-117 and D-8. 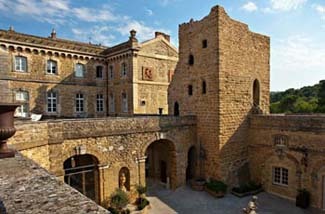 The bare stonework of this medieval castle’s exterior belies the ornate style inside. The lounge, with its huge carved baronial fireplace, makes a cozy spot to read. The medieval armory is now a flower-filled dining room opening onto a cobblestone courtyard. Vaulted stone corridors, an ancient dungeon, and huge underground cellars that have been excavated only recently invite exploration. Guest rooms—many quite large—are individually decorated with antique period furnishings and Provençal fabrics. Excellent cuisine (try anything with the local truffles).